DAP Socialist Youth (DAPSY) had one four days ago issued an official invitation letter to MCA Youth Chief YB Datuk Liow Tiong Lai to an open debate to debate on the contribution of the DAP towards nation-building. What is more disappointing is that as the chief of MCA Youth, Liow has been avoiding to reply on the debate with no follow up with DAPSY in finalizing the fine details of the debate. Instead, MCA Youth staged their second or third-liner leaders to come out with open statement, repeatedly counter-proposing on the fine details with the intention to blurr the public vision on the real meaning of the debate. MCA Youth should take up the challenge sportingly and come clear on several issues, including the decision of the Pulic Service Department (PSD) of not recognizing the academic qualification of Tunku Abdul Rahman (TAR) College, a college founded by MCA itself in 1969. It is mind-boggling to witness that the academic qualification of TARC graduates not recognized by PSD while TARC graduate enjoy good pays and salaries in the private sector, some even on par with graduates from local and foreign universities recognized by the PSD. TARC is not only found by MCA but is also subsized by the government on a one-ringgit-to-one-ringgit basis. If the government can subsidize the college, it is unreasonable for the government to refuse to recognize the college, more so when MCA is the second largest component party in the Barisan Nasional. And therefore, I would like to strongly urge the MCA Youth to come clear (堂堂正正、清清白白、踏踏实实) on this issue, and the best way to do that is to accept the invitation from DAPSY to attend an open debate and clarify the issue, once and for all. If the MCA is fighting for the government to recognize Chinese studies bachelor degree conferred by Peking Univerisity and Qinghua University, two top universities in China, why does MCA neglect the college it founded? Is it not another clear example that MCA is only a puppet in the ruling coalition? Has MCA started their struggle to push the government to recognize the academic qualification of TARC? If yes, then can there be an announcement of the progress? DAPSY Deputy Chief YB Chong Chieng Jen will pose this queston to the Minister of Higher Education and Prime Minister Department when debating on motion of thanks for the Royal Address. But it would definitely do MCA Youth no harm if they can come out with an open and complete explanation not only to the students and graduates but also to their parents and potential students, and the best chance to do that will be to attend the debate with DAPSY. Instead of wasting valuable time writing statements in counter-proposing our requests, attacking the DAP Secretary-General Lim Guan Eng and PKR leaders , Chai Kim Sen, Lee Wee Kiat, Soon Tian Szu should turn back to their own Youth Chief to accept DAPSY’s invitation. Lee Hwa Beng robbed of his car! The Singapore Great Strategy To Brain Gain - Absorbing Malaysian and Chinese Talents! Klang Municipal Council (MPK) enforcement officers behaving high-handedly with the ordinary public, as in the following clip from a camera phone on Star online report, “Fine mess, says tailor in MPK incident”. What was all the hullaballoo about? Over parking ticket! KLANG: Humiliated and enraged, that’s how Pua Chia Teng feels after several Klang Municipal Council (MPK) enforcement officers dragged him from his shop and bundled him into a car before taking him to the police headquarters here, all over a parking fine. Pua, 35, a tailor at Jalan Raja Hassan said it started over a parking fine issued at 2pm on Wednesday. “It all began with my elder brother Khiau Seong. He had parked his Mercedes Benz along Jalan Raja Hassan without a parking coupon. As an MPK parking attendant walked towards the car, Khiau Seong shouted out at him not to issue a compound as he was on his way out,” he said. He said the attendant ignored his brother's plea. “Khiau Seong rushed out and within minutes a scuffle had broken out. I ran out and separated them while two other attendants watched. The three MPK attendants then walked away and Khiau Seong drove off,” he said. Pua added that 10 minutes later, a group of MPK enforcement officers barged into his shop demanding he follow them to the Klang police headquarters to give a statement regarding the scuffle. He refused. Pua said the officers then dragged him from his shop and forced him into their car. They then drove to the police headquarters. “I was dragged out in full view of passers-by and other shop owners. It was humiliating,” Pua said. “At the police headquarters, I had to pay RM1,000 bail to be released,” he said. Selangor DAP deputy chairman Peter Tan said he plans legal action over the matter. “It is unbecoming of the staff to act in such a manner,” he said. Council president Abdul Bakir Zin declined to comment on the way his men had taken Pua to the police headquarters. The complainant was in the Parliament today to highlight the case to Datuk Seri Nazri in his capasity as Parliamentary Human Right Caucus Chairman. As a child in the early 1980s, he saw firsthand police at work in fighting off the last remnants of the communist threat in Raub, Pahang. Several doses of Jackie Chan’s Police Story series later, he decided that his calling is to fight crime and keep the peace. 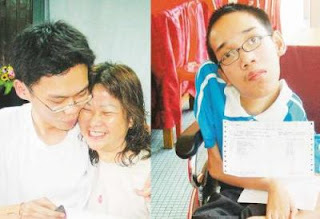 Unfortunately, after graduating with a degree, Soo Pak Leong is denied his dream despite repeated attempts to sign up. Now at age 27, he is too old to be considered by the police force. Soo’s problem was simple - his degree, a Bacher of Science from Tunku Abdul Rahman College (TARC) is not recognised by the Public Service Department. The department determines academic qualifications that are recognised by the government sector. “I have a strong urge to join, but the system does not allow me,” Soo told reporters at a press conference at DAP Selangor headquarters in Petaling Jaya today. He has applied three times to join the police, taken his case to numerous departments and had even aired his grievances on radio earlier this year. His is not an unique case, said DAP Selangor secretary Lau Weng San. “It’s another disappointing scenario when the government and MCA have been urging the Chinese to join the police force and yet we have this case where Soo was turned down,” he said. Lau blamed the MCA youth education bureau for not trying hard enough to get Soo into the police force. TARC was established in 1969 by the MCA. The Chinese-majority party partly funds the college. Soo’s first applied for the cadet assistant superintendent of police in 2004. He was 24. It was rejected with no reasons given. He tried again the following year, again with no reply. Before Soo reached the ceiling age of 25, he tried again, this time for the Inspector post. This time, Bukit Aman replied and said that his qualifications was not recognised. After further enquiries, the PSD concurred. Lau said the MCA has to answer one disturbing question. Why are TARC qualifications not recognised by the government. Their graduates used to have great career prospects in the private sector,” said Lau. Referring to MCA’s attempts to get recognition for degrees from two universities in China, Peking University and Qin Hua University, he said the party should not abandon its college at home when thousands of TARC students are not recognised. “But I just want to let other people know, especially Chinese parents, that if their children want to join the government service, they should go through STPM first and check with the PSD,” he added. Another classic example of NEP in works! The DAP has received a complaint from a graduate of Tunku Abdul Rahman College (TARC). Academic qualification: Advanced Diploma in Science / Diploma Lanjutan Sains (Kolej Tunku Abdul Rahman 2003) and Bachelor of Science (degree conferred by Campbell University 2003). Graduated from TARC at 2003. Have been applying to join the Royal Malaysian Police Force (PDRM) for three times since 24 year-old (year 2004) as Cadet ASP but in vain. Applied for the second time in year 2005 as Cadet ASP. Nobody from the government replied that his application failed. PDRM’s Website has mentioned that if applicant is not called for interview within three months from the application, then the application is considered failed. Last application for Inspector was made in year 2006 when Soo reached the ceiling age 25 year-old to apply to be a police. (Soo has yet to reach the age of 26 years old at the time of application). Has seek clarification from Bukit Aman on his application status (previous failure) during the third application. Have been advised that the his qualificatios are not recognized. Seek further clarification fron PSD on 1st June 2006. Zuraini bt Abidin, Officer from the Recognition of Qualification Unit, Training Division of Public Service Department of Malaysia replied his email on 5th June 2006 that his academic qualification is not yet recognized by the government for the purpose of recruitment in the public service sector. Wee Ka Siong, MCA Youth Education Bureau Chief replied that this is not the first time that the PSD refused to recognize academic qualification from TARC and that the MCA Youth will pursue this issue. It is indeed another classic example of discriminative policy by the government of the day when TAR College (TARC) graduates’ academic qualification is not recognized by the government of the day, a failure which MCA, the founder of the higher education institute cannot deny. Soo Pak Leong is a graduate from TARC whereby he received an Advanced Diploma in Advanced Diploma in Science / Diploma Lanjutan Sains (Kolej Tunku Abdul Rahman 2003) and Bachelor of Science (degree conferred by Campbell University 2003). He has applied to join the Police force three times consecutively since 2004 but he failed in all his three applications and now that he could not apply again as he has reached the maximum age limit. It is another disappointing scenario when the government and MCA has been urging the Chinese to join the police force and yet we have another case here where Soo was turned down. It is also mind-boggling as to why TARC academic qualifications are not recognized by the government when TARC graduates used to have great career prospect in private sector throughout the years. MCA should not ‘abandon’ its own college at home when it struggles for government recognition Chinese Studies Bachelor Degree conferred by two prestigious universities from China, namely Peking University and Qing Hua University, when at home, thousands of students in TARC are not recognized by the government. Is MCA hiding this very crucial and important fact from the public, especially its students and parents that the qualification is not recognized by the government? Should MCA and the management of the college make this clear to its potential students and parents for their next intake? The DAP will pursue this issue and we will raise this in the current parliament sitting and the Ministry of Higher Education and Ministers in the PM Department will be asked such questions. DAP did not boycott Batu Talam by-election, Liow Tiong Lai should not mix up! MCA Youth Chief Liow Tiong Lai yesterday issued another malicious statement in Kota Bharu when he accused the Opposition as inconsistent in their statement and stands as the Opposition now decided to contest in Machap by-election when they boycotted the Batu Talam by-election in January 2007. Liow should be concise and accurate in his statement as he should not treat all Opposition parties as the same. DAP has since Batu Talam by-election clarified that it is not the decision of DAP to boycott any by-election or General Election. 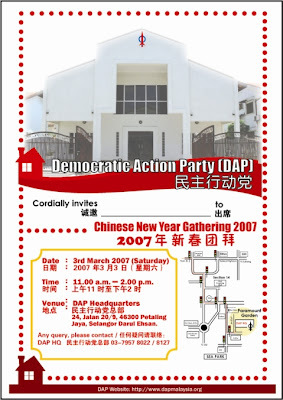 DAP did not contest in the Batu Talam by-election simply because the state seat is not our traditional seat and we did not even contest during the 2004 General Election. To say that DAP’s stand is inconsistent is something extremely malicious. Furthermore, the DAP has clarified that if a by-election were to be held in a seat that the DAP had previously contested, then naturally the DAP will not boycott but to contest in the by-election. This is also why we contested in the Machap by-election this time. As for Batu Talam, the seat was previously contested by UMNO and PAS, therefore the DAP did not contest in the by-election. Liow Tiong Lai shall not issue such malicious statement prior to the Machap by-election. If Liow Tiong Lai does not know how to differentiate between “not contest” and “boycott”, or he chooses to mix up between DAP and KeADILan, then he should immediately sign up for History of Local Politics class with MCA Party School so that he can have a quick catch-up before making more mistakes in his statement. DAP categorically denies that the party has any electoral pact with PAS. MCA President Datuk Seri Ong Ka Ting alleged yesterday that a PAS-DAP alliance was in the making for the upcoming Machap by-election. Ka Ting’s statement is a clear indication that the second largest partner in Barisan Nasional has no confidence to debate and articulate policy matters in the by-election. Instead of convincing the voters to endorse BN’s policies, MCA is resorting to age-old negative campaign tactics to spread fear and lies, such as that of a PAS-DAP alliance. Just because PAS has indicated its disinterest in contesting in the Machap by-election, Ka Ting says it all points to a pact between PAS and DAP. His reasoning is completely nonsensical. DAP’s stand on the issue of Islamic State is crystal-clear: the party supports neither an ‘Islamic state ala UMNO’ nor an ‘Islamic State ala PAS’. So long as PAS promotes an agenda to form an Islamic State in the country, there will be no cooperation from DAP. Double Track - Another election goodies?? All in a sudden, we have this news that the Cabinet has decided to continue the double-track railway project. Will this be another election goodies since the government had once decided to shelved the project in 2004? DAP Selangor would like to register our strongest disagreement against the MPSJ’s decision to legalise the cabins squatting on open spaces and we will fully pursue the issue to fight for the legitimate rights of the residents. The issue was reported in today’s The Sun as front page report which quoted the President of Subang Jaya Municipal Council (MPSJ) as saying that the Council has already approved the legalized cabins placed illegally in open spaces by issuing them temporary permits which are valid till end of the year. The information we received that about 30 residents from Bandar Bukit Puchong from BBP Section 3 have signed to protest against two illegally placed cabins on Jalan BBP 3/4 as UMNO temporary offices. The cabins are said to have occupied the place for 8 months. There is another cabin in Jalan BBP 3/8. Lawyer representing the residents Mr Eugene Mark told the press that when the residents launched a signature campaign to protest against the illegal cabins, they were assaulted and harassed by a group of thugs consisted of 20 men who claimed that they were from UMNO Bukit Puchong. The residents have sought help from Gerakan MP for Puchong Lau Yan Peng but he failed to turn up to provide assistance. We fail to understand why MPSJ could make such a u-turn to legalise the cabins and not taking any actions against the law-breakers. Moreover, the council and Selangor MB have previously claimed that the owners of the cabins must apply Temporary Occupancy License (TOL) before they can squat their cabins in open spaces. The council has put up a reason that ‘only a small group of residents protested’. Actually the problem at it’s first hand is not so much about the number of residents protested by of whether the council has followed proper procedure before they decided to legalise the cabins. And now the council claimed that the requirement of TOL is only applicable on “permanent structures, made of concrete with parking lots and so on and that these cabins are mobile and easily removable. We want to know why the council president could make such a drastic changes in stand? Are there any political pressure? If yes, then who exert the pressure? Is this person so strong until Puchong MP Lau Yan Peng can succumb to him? Lau Yan Peng as Puchong MP should know that he is a people representative elected by majority of the people and he shall take up the case without fear or favour. Is he depending on the UMNO to ensure he can defend his seat under BN ticket for the next general election? If this is the case, Lau Yan Peng shall step down as he is no longer credible as an elected MP. Speaker: Sdr Tony Pua, Economic Advisor to the Secretary-General. Moderator: Sdr Lau Weng San, Chairman of PJ Action Team. The Director-General of Department of Environment Datuk Rosnani Ibrahim tow days ago commented in News Straits Times that low-sulphur petrol and diesel with 0.05 percent of sulphur which comply with EURO II emissions standards will be available next month. With lower sulphur content, it is believed that the fuel would become more environmental friendly. Rosnani also elaborated that oil companies should be able to absorb any extra cost in coming out with lower sulphur content fuel. DAP welcomes the introduction of low-sulphur fuel in Malaysian market but would like to reiterate that until there is an alternative for motorists, either in the form of an improved and efficient public transportation system, lower oil price or introduction of alternative fuel like biofuel in the market, else the introduction of low-suphur fuel in Malaysian petrol kiosks will be less meaningful if it is not coupled with any of the three alternatives above, especially the latter two. When the government decided to increase oil price by 30 sen on 28th February 2006, international crude oil price is only USD 60 a barrel. Although it has surged to more than USD 70 a barrel, international crude oil price later stabilized at price below USD 60 per barrel, a level which is lower the level it was when the government increased the price. At one time, it even dropped to close to USD 51 per barrel, raising much concern from motorists to demand the government to reduce oil price. Government assurance in early January 2007 that there will be no price hike for petrol and gasoline is equally meaningless as the valid concern of motorists today is not about the government is going to increase the price or not, but of whether the government is ready to cut the price to reflect it’s actual level in international market as what the government justified when oil price was increased one year ago. Although the introduction of B5 biodiesel (5 percent palm oil mixed with 95 percent diesel) is much lauded when it was launched in mid 2006, there has not been much improvement except that the production of biodiesel is mainly to serve foreign markets. Worst still when there are only five companies out of 90 companies are active biodiesel production companies. This is not quite encouraging when the fuel has not been able to be marketed in domestic market to serve as alternative fuel for motorists. Is the government more interested to market the fuel in oversea markets rather than benefiting domestic motorists with more affordable and cleaner fuel? The question is clearly not so much on the quality of the fuel we use but more on the right-to-choose we have as consumers and motorists. It seems that PAS President Datuk Seri Abdul Hadi Awang has not given up the hope to turn Malaysia into an Islamic State. Hadi Awang also twists and turns the fact that there was no reason why they (the non-Muslim) could not accept the concept of an Islamic state, since non-Malays accepted capitalism, socialism and other Western ideologies, as reported in today News Straits Times. DAP Selangor would like to remind Hadi about the very fundamental foundation of the country – despite that Islam is the religion of the Federation, Malaysia is not an Islamic State and other religions can be practiced in peace and harmony in any part of the Malaysia. It is this main idea of the doctrine of separation of religious elements from various nation building agenda including the administration of governments from various levels. And therefore for Hadi Awang to call for an Islamic State in a plural society like Malaysia is not only unconstitutional but also incompatible with the plurality of this country. To accept that Malaysia is an Islamic State is no difference from abandoning the 50-year Merdeka “social contract” that Malaysia as a democratic, secular and multi-religious nation with Islam as the official religion but not an Islamic State - whether ala-PAS or ala-UMNO, whether through the UMNO and Barisan Nasional “Islam Hadhari” or the PAS Islamic State Document. In fact, the first Prime Minister of Malaysia, Tunku Abdul Rahman, the second Prime Minister, Tun Razak and the third Prime Minister, Tun Hussein Onn publicly and the fourth Prime Minister Tun Dr Mahathir (for the first 20 years as PM) had championed and defended the Merdeka compact of Malaysia as a secular democracy with Islam as the official religion. It is a fallacy that just because the majority of the populations of a country are Muslims, the country must become an Islamic State, as the majority of the countries in the world with Muslim majorities are not Islamic States. The best example is our neighbour, Indonesia, whose population is 88% Muslims or over 200 million Muslims out of 230 million population. Indonesia, however, is not an Islamic State, but a secular republic and a motion to turn Indonesia into an Islamic State based on shariah law was defeated in the Indonesian Parliament four years ago by the overwhelming majority of Muslim MPs! Therefore, Hadi Awang should acknowledge that Malaysia is a plural society and that any call to turn the country into a state of any religion, be it Islamic State, Catholic State, Christian State, Buddhist State or Hindu State is unconstitutional, incompatible in Malaysia and violate the fundamental basis of nation-building process. My friend, Tony Pua, has been talking about RHB takeover by EPF. It is in fact very inspiring to read the "economy savvy" statement from Tony with more analytical stuffs rather than normal "bombarding" remarks. I am certain that he started his political career in the DAP on the right footing and I am glad to work with him. The theme for International Women’s Day 2007 is “Ending Impunity for Violence against Women and Girls”. In Malaysia, although there are national legal and policy frameworks which have been established, covering many different forms of violence in public as well as in private settings, progress in the development of such legal norms, standards and policies has not been accompanied by comparable progress in their implementation. It remains insufficient and inconsistent in all parts of the world. The Government has the obligation to protect women and girls from violence, to hold perpetrators accountable and to provide justice and remedies to victims. The failure to meet these obligations is unacceptable. When the Government fails to hold the perpetrators of violence accountable and society explicitly or tacitly condones such violence, impunity not only encourages further abuses but also gives the message that male violence against women is acceptable and normal. The result is the denial of justice to the individual victims/survivors, as well as the reinforcement of the prevailing gender inequality. Eliminating violence against women remains one of the most serious and urgent challenges of our time. Every one has a responsibility to act when confronted with violence. Each one of us has a duty to support and sustain a political and social environment where violence against women and girls is not tolerated; where friends, family members, neighbors, men and women, intervene to prevent perpetrators to go unpunished. In order to achieve this, women participation in the political arena is a vital factor. Although women nowadays are as capable as men in various fields of the society, the continued lacks of women participation in politics and decision making must be seen as a cause for concern for all Malaysians. While politics concern almost on all aspects of lives, women shall play and shall be able to take a much influential position in the decision-making process. Women in Malaysia do not only suffer from unequal pay but also dwindling security protection, occurrence of sexual abuse and sexual harassment in work places. Such worsening situation shall serve as a major cause for concern for women to be more actively participated in political reform to ensure the safety of women. Moreover, one cannot ignore the enormous economic contribution by women in this country that the economic performance of this country will be severely jeopardized if women’s rights are not upheld or looked into. Only by encouraging more women to participate in politics and policy decision making process, then it would become more meaningful to talk about upholding rights of the women. If the rights of the women are not upheld, similarly there will be no uphold of basic human rights. Let us strive for a safe, stable and secured society for Women in this country. I refer to the letter Bkt Antarabangsa folks fed-up with BN rep. It is a good observation which is typical of what’s happening in all constituencies where BN representatives rule. Thanks to citizen Dr Mohamed Rafick Khan for taking time to write. In my constituency of Damansara Utama, I don’t even know who is the rep is although I did vote for him (BN-MCA) in last election. I was actually voting for the PM for all his empty ‘walk the talk’ talk. The rep never visited the constituency and never bothered to avail himself to the people. What a shame on this BN-MCA rep. I fully agree with Rafick’s advice of ‘don’t vote for the PM or the flag’ but vote for the person who can provide services and is accessible to the people. In the next election, my vote will be for the person and not the flag or PM. During the last general election, being residents of Bukit Antarabangsa in Ampang, Selangor, we gave our family votes (a total of five votes) to the Barisan Nasional state assemblyperson for Bukit Antarabangsa whom we know as YB Azman Wahid. For your information, Azman was my schoolmate in Ipoh way back in the late 70s at the Sekolah Raja Chulan in Ipoh, Perak. Out of an ‘espirit de corps’ and being an old friend, I told my family members to give this green politician a chance. Because of our five votes (and many others), he was elected. Now after three years, this is my report card on the YB (since the PM and menteri besar has said many times that they also have a report card system). Below are several reasons why we will not re-elect him or any BN candidate at Bukit Antarabangsa. Has the state assemblyperson made himself accessible? My own survey among friends in Bukit Antarabangsa show that they don’t even know who YB Azman is and what he looks like. He has failed to advertise himself and publicise how the people of Bukit Antarabangsa can reach him. No one knows where his office is. In the era of e-mails and handphones and SMSes, this is not acceptable. What was his plan for Bukit Antarabangsa? As far as I know, we have seen no development for the last three three years. This for a population of educated people. Maybe he has plans which he has kept to himself. But not telling us is equivalent to having no plans at all. We can see the deteriorating basic infrastructure without any new projects planned. We have no schools, no permanent police ‘pondok’, no library. We only have the poor and rapidly deteriorating facilities built by MBF 15 years ago. The name Bukit Antarabangsa means International Hill. Sadly, the environment and infrastructure is far from its name. Road conditions are extremely bad and are worse than the roads at Kg Jabi, Terengganu (my wife’s kampung). We should be ashamed of our infrastructure. I wonder how often the YB drives into our area to notice the famous Bukit Antarabangsa Motocross. Has the state assemblyperson ever listened to the voice of the people of Bukit Antarabangsa? At the entrance of Bukit Antarabangsa is a failed food court project. When the project was initiated, there were plenty of objections from many parties. The state assemblyperson failed to convey the feelings of the people to the MPAJ and the state government. Today, the food court is an eyesore. It reduces Bukit Antarabangsa’s status to that of a low-cost neighbourhood. My suggestion to the mosque president to organise a signboard placement at the site of the new proposed mosque was quickly done by the mosque committee. The YB came and people had to open the door for him. At the signboard placement ceremony, this state assemblyperson promised the sun and the moon to us but so far nothing has come of it yet. This mosque project has been delayed for nearly 10 years now. What has the YB done? He claims this has been brought to the MB’s attention. Well, it appears that both the MB and the state assemblyperson have failed to keep the people informed of progress on this matter. Has he initiated any community-relations fostering programmes in Bukit Antarabangsa? Not that I know off. All I know was that he did officially open one such programme but this programme was not initiated by him but rather by some residents of Bukit Antarabangsa. National and state-level issues - where is he? Have you ever heard of this guy bringing up important state and national issues related to the environment, the community and the grassroots? During the recent major floods in Johor Baru, I had expected our state assemblyperson to organise some charitable activities that could help the affected people. Did we hear his voice. Did we see his picture? You know the answer. My dear fellow residents of Bukit Antarabangsa, I have only one advice for all of us. All of us are educated to a certain extent. Let’s judge the performance of an individual based on his contributions. Evaluate objectively the performance of our state assemblyperson. Don’t evaluate the flag or the logo or the party. Cast your vote wisely. Choose the person and not the flag or the picture of the PM. Choose someone that we know. In my case, I knew him in school and since 1978 but did not meet until almost 25 years later. One thing I can say now is that people change. I am not going to make the same mistake again. Azman, you still have time to redeem yourself. Do something concrete, otherwise you will lose five votes from my family.